See Chance News 52 for a review of The Flaw of Averages by Laurie Snell. "Using a model of no greater sophistication than that employed by Benjamin Franklin (weather generally moves from west to east), I was able to predict that the area of precipitation currently over Ohio would be hitting New Jersey by tomorrow and would stay over us until the weekend. Any fool could see it. The improvement in forecasting has not been entirely due to improvements in the mathematical models of the weather. The enormous wealth of radar and satellite data summarized into a multicolored and dynamic graph can turn anyone into an expert." "This is about visual thinking and visual evidence …. It's not about commercial art. The last thing in the world that's needed here is a designer. What's needed is an analytical, statistical, quantitative approach. Reporting is different from pitching. Artists who design for marketing purposes inherently have problems with credibility. This is something very different in spirit. It's about accountability and transparency—with heavy, heavy amounts of data." Click here to view Tufte's "Lights-On" data map, created for the Recovery.gov website. "[A] Public Policy Polling survey released Thursday found that Gingrich's favorable rating with GOP voters has dropped 27 points in the last month--from 52 percent to 38 percent." "On another occasion, Bailey and other staffers spent hours voting repeatedly to manipulate a television opinion poll on Palin’s decision to reject part of the federal government’s economic stimulus funding." Never mind the politics--this illustrates the worth of [voluntary] television opinion polls. "Connecticut has the 2nd highest incidence of breast cancer in the U.S.
Connecticut. DON'T settle for second place!" "If your name is Peter or Deborah, you're more likely to be a CEO. That's what the social networking site LinkedIn found." You can listen to the rest of this Vermont Public Radio broadcast here. 1. A tweeted comment on this site says: "Great analysis, although this can be explained mostly by the age group ..." What are the implications of this? How might you explore them? 2. Paul Alper pointed out a post from Andrew Gelman's blog, where are reader cited a gruesome infographic that accompanied the original LinkedIn story. by Howard Wainer, Princeton, 2009, p. 171. This book is a collection of articles that Wainer had authored/co-authored in Chance (2000-2007), American Scientist (2007), and American Statistician (1996). In Chapter 16, "Galton's Normal," Wainer gives an example of the relative heights of the points on a standard normal curve and of why our sketches of normal curves do not, and cannot, come close to accurate scale drawings. Even if the height were 1 mm at z = 6, the height at z = 0 would be 66 km. Thus it still could not be drawn to scale. On a humorous note, the author confesses that since joining Twitter she can't help regularly checking her number of followers. But the more serious question is this: Are we as a society too dependent on numerical rankings? The article quotes MIT professor Sherry Turkle: "One of the fantasies of numerical ranking is that you know how you got there. But the problem is if the numbers are arrived at in an irrational way, or black-boxed, so we don’t understand how we got there, then what use are they? " The article gives several examples, two of which happen to correspond to stories that were recently discussed in Chance News 71, namely college rankings and New York City's formula for rating teachers. Bialik discusses the prosecutor’s fallacy in the context of reporting about the identification of Osama bin Laden’s body. He does not dispute the identification made by government officials, said to have been based on a number of factors, including DNA. However, he reminds readers that “claimed match probabilities, such as 99% or 99.99%, can be misstated or misleading” and that further details about a DNA test, as well as evidence related to other factors, must be taken into account before having confidence in an identification. The problem boils down to this: A very small chance of a false positive in a genetic test isn't the same thing as a very large chance of a positive identification. Click on the link to view interactive scatter diagram, which allowed responses on two dimensions: "Was his [bin Laden's] death significant in our war against terror?" and "And do you have a negative or positive view of this event?" Respondents were asked to plot a point on the graph, and include a statement of their opinion. What do you make of the patterns in the plot? Did you know that if you touch your left ear with your right thumb and wiggle your toes when the country you want to win begins to sing, that country will inevitably lose? It is a superstition that I have just invented, but I bet it works. Try it tomorrow and see. Give a statistical reason why Champkin’s method would work well, on average, with or without touching your ear and wiggling your toes. Silver criticizes a Brookings Institution study of mass transit in the U.S.; he is surprised that it came to such strange numerical results: "New York, however, ranked just 13th. Washington ranked 17th. And Chicago ranked 46th — well behind Los Angeles (24th). Instead, the top 10 metro areas [for public transport] according to Brookings were Honolulu; San Jose, Calif.; Salt Lake City; Tucson; Fresno, Calif.; Denver; Albuquerque; Las Vegas; Provo, Utah; and Modesto, Calif."
I want to point out that just because a study uses objective criteria, that doesn’t make it sensible. In fact, studies that try to rank or rate things seem especially susceptible to slapdash, unthoughtful methodology (here is another example: a study which concludes that Gainesville, Fla., is a more gay-friendly city than San Francisco). If you come up with a result that defies common sense — like Modesto’s having better public transit than New York — then once in a blue moon, you may be on to something: conventional wisdom is fallible. But much, much more often, it’s a sign that you’ve done something wrong, and it’s time to reconsider your assumptions before publishing. Nathan Yau is a Ph.D.candidate in Statistics at UCLA, who has a wonderful website about data displays, FlowingData. It contains lots of examples, including “ugly” ones. According to an article in Significance online, Harold Wilson, who served twice as UK Prime Minister (in the 1960s and the 1970s), was educated as an economist and also worked as a statistician, serving a term as President of the Royal Statistical Society (in the 1970s). Silver warns that, although higher unemployment in November 2012 will probably mean a lower likelihood of Obama being re-elected, there is no “magic number” for a rate or its behavior that would be sufficient by itself to predict the outcome of that election. 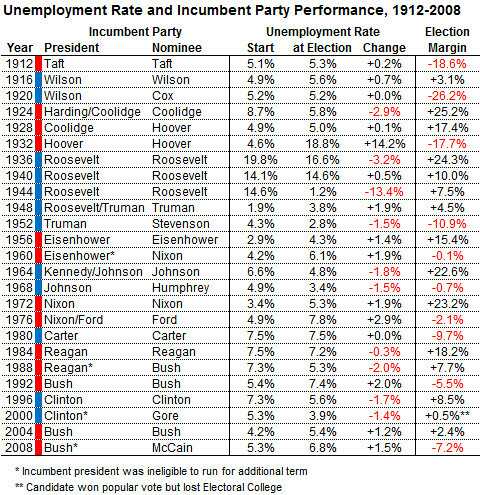 (c) unemployment rates and margins of victory when incumbent presidents sought second terms 1912-2008 (R^2=0.0162) and changes in rates for those presidents 1912-2008 (R^2=0.265). See also “Gas Prices vs. Presidential Support” in Chance News 72. When looking at patterns of practice across the United States, sometimes, but rarely, the variation actually reflects medical need. [I]f you look at the actual survival, you see that patients with hip fractures and colon cancer and heart attacks actually had higher mortality rates if they lived in the higher-spending regions than if they lived in the lower-spending regions. There was no difference in patients’ functional status and satisfaction with their care, and their perceptions were that their access to care was worse. [T]here’s a lot of hard work ahead. The general rule in my experience has been about 10 years of denial of data, five years of blaming somebody else for the problem, and finally a crisis in which they say “Maybe we should roll up our sleeves and get to work.” We don’t have that kind of time in terms of the train wreck that Medicare is heading toward—that our whole system is heading toward. (c) More Harm Than Good, book by Alan Zelicoff MD and Michael Bellomo, 2008, in which the authors discuss the Dartmouth project and argue for more evidence-based health care and statistical/scientific training for doctors. 1. Does the 91% figure refer to the probability of heart disease given periodontitis, or to the probability of periodontitis given heart disease? 2. Why might a 60-year-old patient be more interested in his/her chances of heart disease after a diagnosis of periodontitis than the chances of periodontitis after a diagnosis of heart disease? 3. How would you design an experiment to determine the probability of heart disease after a diagnosis of periodontitis? The two other topics reported by a low number of medical schools to have some required hours of instruction were pharmacology (reported by 26) and pathology (reported by 31), both of which might be presumed to involve some quantitative reasoning. In comparison, a range of 43 to 73 schools reported some required hours in other science topics, ranging from genetics to neuroanatomy, respectively. [T]he vast majority of residents don’t know how to read a medical paper. …. Thinking through new evidence simply isn’t part of medical training in general.” It’s long past time that hours wasted in memorizing obscure anatomical structures … be replaced with a statistics requirement for all students. This page was last edited on 9 June 2011, at 13:58.